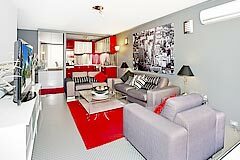 Carrington Budget Apartments are among the most centrally located and best priced apartment accommodation available in Sydney. 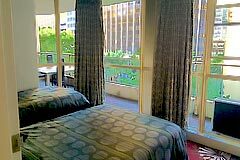 Though some have said the furnishings are dated, the apartments are spacious and clean and provide an inexpensive base from which to explore Sydney - if you are a tourist to Australia's largest city and seeking to keep the cost of accommodation down. 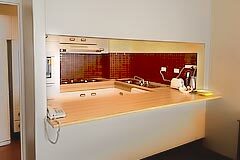 The apartments also suit the business traveller working with a limited travel budget. 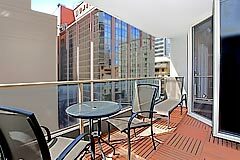 Carrington Apartments are located very near to Wynyard Station making places of interest like The Rocks, Darling Harbour and Sydney Harbour Bridge all within walking distance. Many corporate headquarters are located within the same part of Sydney - allowing Carrington Apartments be a temporary home while conducting business in the Sydney CBD. The building has one and two bedroom apartments, all with self-catering kitchen, internal laundry, air-conditioning and balcony. Disabled Features: There are 10 steps at the entrance and as such my not be suitable for disabled access. No apartments are disabled friendly. 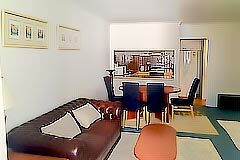 Number of Guests: Rates are for 1 or 2 guests in One Bedroom Apartments and for up to 4 guests for Two Bedroom Apartments. 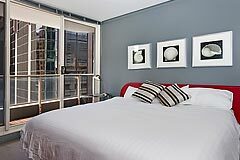 Minimum Stay: 7 night minimum stay applies. Residential Building: Carrington Apartments is a fully residential building. As such, reception can assist with directions and other similar maters only. No hotel services are available. Payment: Full pre-payment is required to secure your reservation of at least the first 28 nights. Thereafter, monthly in advance. Once payments are made, they remain non-refundable for any reason including no show or cancellation.